Autophagy is a conserved, regulated cellular process for the degradation of abnormal proteins and disrupted organelles. 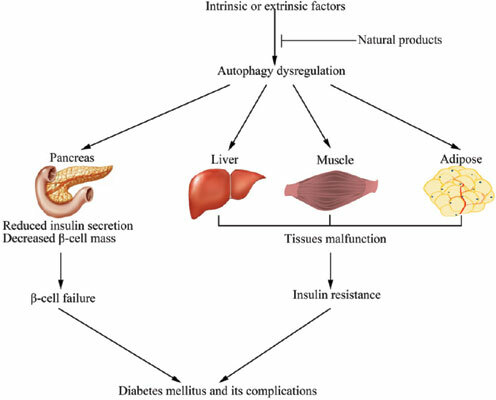 Literature has described that dysregulation of autophagy is closely related to the pathogenesis of diabetes mellitus in processes such as impaired pancreatic β cells function, peripheral insulin resistance and diabetic complications. Emerging evidence indicates that natural products may possess anti-diabetic activity via regulation of autophagy. In this review, we summarize natural products targeting the pathogenesis of diabetes mellitus through the regulation of autophagy and underline possible mechanisms, providing potential drug candidates or therapies for the treatment of diabetes mellitus. Autophagy, diabetes mellitus, insulin resistance, natural products, diabetic complication, pathogenesis.